I am sixth generation Australian. Our first relatives were convicts: William Henry and Jane Carr. They arrived on the 'Earl of Cornwallis' in 1801. I was born at Chatswood Community Hospital. My family lived in Lindfield. I am the youngest of seven children – four boys and three girls. There was a big age difference between the oldest – a boy – and me. My brother enlisted in the R.A.A.F. and was stationed in England during the Second World War. He married there and when he and his wife returned to Australia they had their first child. I was an aunt at four! I have always had lots of children around me. There were always lots of people coming and going at home as this was a time of readjustment for the country. Mum seemed to take it in her stride. Dad was the typical father of that time – very strict. When he said jump you said how high! Mum adored dad and he was waited on hand and foot. Actually all the males were! I was educated at Loreto Convent Kirribilli. It was there that we were exposed to the seeds of social justice. This complimented the actions of my family, especially my mother. The philosophy of the school was based on the teachings of Ignatius of Loyola who started the Jesuits. I enjoyed school, but I was glad to leave. I played representative tennis for five years at High School. When I left school I became a teacher starting at Neutral Bay. After I was married I taught at New Lambton in Newcastle. I retired from teaching just before the birth of my first daughter Teresa. My husband, Maurie gained his Ph. D. from the University of Sydney. We then immigrated to Ottawa, Canada. Our second daughter Lisa was born there. The climate there was extreme to say the least. Even though we were accepted and spoke the language we were still outsiders. It gave us some understanding of how migrants and refugees feel when they arrive in Australia. This was a further input to my understanding of being an “outsider” as the refugees are. We decided that Australia offered us more. We returned to Sydney. Maurie was a lecturer at Macquarie University. Our third daughter Jenny was born a year later. We had bought a house close to the Uni but it was not a very interesting place to live so we decided to move to Avalon. 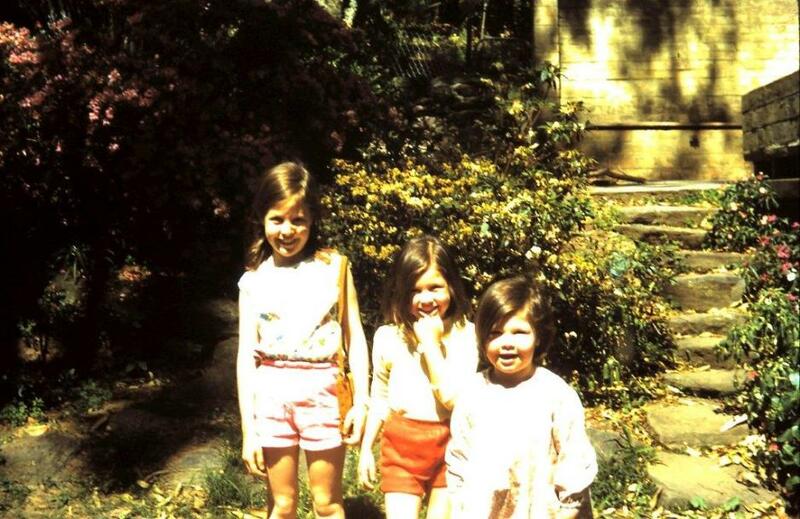 Liz with daughters Teresa, Lisa and Jenny. We lived in Avalon for 25 years before we moved into our present home in Newport. We have lived here for 17 years so far. We love this area. It is one of the very best areas of Sydney. We love the trees. My least favourite sound is of chainsaws. Trees that have been growing for decades are cut down in a short time. Unfortunately new trees are not planted to replace them. The Tree Preservation Act seems to have disappeared. We regularly had koalas in the trees as they had a circuit of grey gums around us. We could always show them to visitors, but with the introduction of fences and dogs and cats they have been wiped out. We still have wonderful bird life and other wildlife still exists, though in reduced numbers. It has changed quite a bit over the years. It was very varied economically when we first came down. Life moved at a slow pace where you would usually see a familiar face and you knew many of the shop keepers. It is quite trendy now. The water is a draw card, whether it is the ocean or Pittwater. We are lucky to have a deck where we can sit among the trees and watch the passing parade on Pittwater. We have lived through some extreme weather times in the area. There were cyclones in 1974 and 1978 which did huge damage to the area. The downtown area of Avalon was flooded several times and we even had sago snow once. One of the best things that has improved the area was when sewerage finally being put through. This was in the 70s when the then Federal Labor Government made funds available so that every school was connected to the sewerage system. This not only improved the aroma of the area, but people’s health! Our daughter Teresa started school at Maria Regina School, Avalon and she was followed by her sisters, Lisa and Jenny. We didn’t know many people in the area so we went to a Parents and Friends meeting. Maurie was asked to collect the growth figures for the area. Shortly after that he was voted in as President of the P and F. We got to know a great number of like minded people and a long and continuing relationship with them and the school began. We formed very close and lasting friendships with them. Over the years we both worked on the committee. I was the treasurer for some time. We went to Nigeria just after the Biafran War had finished. Maurie was working in the rural area the Western State of Nigeria for the Rockefeller Foundation. We were based in Ibadan which was the capital of that state. This was a tough time as you could take nothing for granted – electricity, water and decent food. I learnt to make yoghurt, peanut butter and how to make interesting meals with limited ingredients. By the time we left Ibadan we were eating quite well. Even though the peace came with relative calm, the evidence of the harm that war does was apparent. It was a good learning curve for all of us as Nigeria was the most populous black country in Africa. The girls attended school there. I helped with reading with the very young ones and I was lucky to be asked to teach English to Year Ten girls. I really enjoyed that. The girls were very eager to learn. Being an Aussie was a novelty for them too. It was interesting travelling in Nigeria. When we drove through a village if someone saw you they would call out “Oyimbo, Oyimbo”. People would run out and wave as we drove through. In the markets in Kano people would touch us just to see what our skin felt like. We all got used to that. The contrast between the rich and the poor was extreme. Unfortunately despite having an abundance of oil, the lives of the majority hasn’t improved greatly. $2.00 a day was the going rate then, as it is now! When we returned after travelling through the U.K and France we settled into Avalon again. There were big changes taking place at Maria Regina School. The school had been given a grant to open up the classrooms and it had become Open Plan and the years Kindergarten to Year Two had become Family Grouped. I became involved as a parent helping the Kindergarten children with things like cooking, reading and writing. I then started doing relief teaching throughout the whole school and finally I joined the staff full time. I worked mainly with the Infants or Stage One as it is now called. At that time there were quite a few Nuns at the school. Sister Kathleen Reynolds, was the driving force of the innovations. It was great being a part of the changes that were taking place in education. Social Justice influenced the ethos of the school. I continued with my teaching career, teaching in a variety of positions in various Peninsular schools from Manly to Avalon. I am still working at Maria Regina School as a Learning Assistant. I am at home there. The staff there is most professional and caring. Each child is given the best opportunity to fully develop their talents. Again Social Justice is very much a part of their development. The School is twinned with the Community of Soibada in Timor Leste. There have been on going activities and programs developed to help this community. My friends and I sew blankets for this community. Maurie and I worked across a range of nations from 1972 through to 2012 with changes and structural matters in Europe, Asia, North America and South America. However, the focus of 2000 and beyond has been the key matters of development. Visit to a school in China. Having been a teacher for so long I feel that the most important thing you can give a child is a secure and supportive environment whilst challenging them to question the world around them and to then take them beyond their comfort zone. You need to firstly develop their skills to read and then give them the love of reading. After that they can teach themselves. Technology also plays a part of building their ability to extend their boundaries. A group of friends and I sew for the Soibada community and for Wrap With Love. My friend Judy and I were moved by a talk we heard on the ABC by Barbara Holbrow about Wrap With Love. It was not long after the Rwanda genocide had taken place. We both talked about the need to do something so in 2002 we started sewing. We have grown to a larger group and we sew all year round. We get together every few weeks to make blankets. We try to get as many blankets done during the day, but being the teacher that I am, if they don’t finish the blanket they start they take it home for homework!!! Some people can’t come so they call in and pick up squares to finish off at home. Some of these friends have kept some of their talents hidden but they revealed them when we had trouble getting enough squares – they have started knitting again. Wonderful! I am a drop off person for Wrap With Love so I get calls from people I don’t know who drop off blankets or squares to be sewn into blankets. The Mona Vale Library has a knitting/sewing group who meet every Friday morning. They are a most productive group. The Staff are most supportive of the group. They have had a Knit In for W.W.L. for several years. This year’s Knit-In resulted in 47 blankets from the day. It was a most successful and rewarding day. I collect the finished blankets to take to the depot at Alexandria. I collect blankets/squares from Minkara Retirement Resort, the Peninsular Gardens ladies, Newport Probis ladies, Westmead Rehab Unit, Newport Anglican ladies, Pittwater Palms Retirement Village and others. The work we do is rewarding for us and warming for the recipients of the blankets. One of the things I enjoy is to spend time with friends and family having a meal and a good wine. I enjoy as many things as I can: music, reading, gardening, travel, sport – although watching now, a good Who Dun-it, jigsaw puzzles, meeting new people and living life to the max.. I don’t have many mantras although a good one is “Do unto others as you would have them do unto you”. People like Dr Martin Luther King, Nelson Mandela, Ghandi and Mother Teresa are people I admire. Our daughter Teresa has lived in the area all her life. Her two boys have been educated in local schools. They are a part of the local Knee Boarding Community. We had a farm in Orange for 10 years which we enjoyed very much, but we sold it last year. We made some really great friends there and we had lots of good times with the local food and wine. I had a very large garden there where I spent a great deal of time which I enjoyed. It too is a beautiful area. Our daughter Lisa lives in Millthorpe and some local friends who were our first house guests have now bought a farm there so we have places we can stay, as well as offers from other friends there. I have been very lucky to travel widely. Maurie (Maurice) was Professor of Geography at University of Sydney for 20 years. We have seen the extremes of wealth and poverty in many countries. We have also met many leading people who work in these areas to help those in most need. By sewing blankets I feel we are doing a little to help the most needy people in the world. Our youngest daughter was a passenger in a car on her way to work on her 18th birthday when the car she was travelling in was run into by a driver who was hung over from drugs and alcohol. She was lucky to survive. She has had over 40 operations since then. She was told once that she would not be able to have children. She has 4. This accident had a profound effect on the whole family. We now have 6 grandchildren who are very precious to us – 5 boys and 1 girl. Our hope is that all our grandchildren will have peace and justice in their lives. They are open Wednesday and Friday from 10.00am to 2.30pm. It is a completely voluntary organisation. 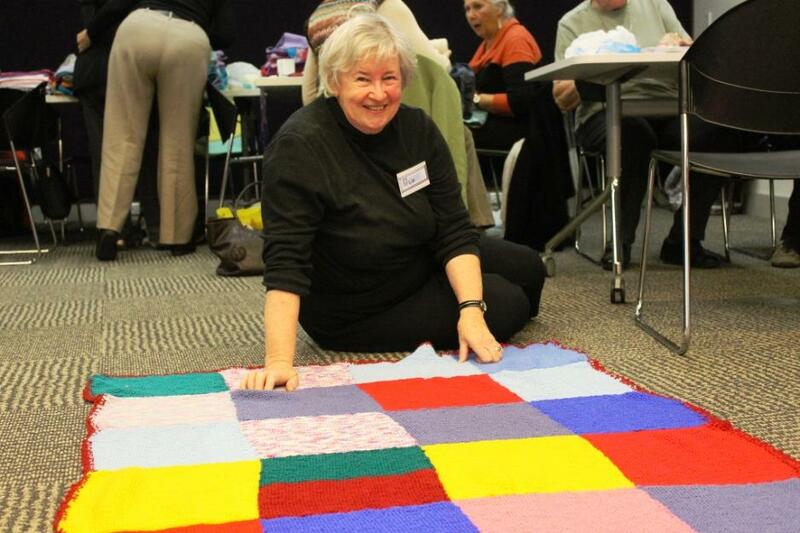 Liz at the annual 'Knit In' at Mona Vale Library, 2013.